Tens of thousands of people have attended the funeral of South African football captain Senzo Meyiwa in Durban. Meyiwa, 27, was shot on Sunday, apparently after burglars entered his girlfriend's house near Johannesburg. A suspect appeared in court on Friday and was charged with the murder of the popular goalkeeper. Meyiwa's death shocked South Africa and has highlighted the high rates of violent crime in the country. 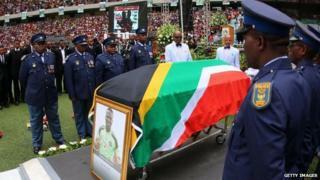 The funeral took place at the Moses Mabhida Stadium in Meyiwa's hometown of Durban. Many of the mourners were wearing T-shirts with a picture of Meyiwa, who was widely seen as an inspiring figure. Others wore red or black replica football shirts in the colours of Meyiwa's team, Orlando Pirates. Meyiwa's coffin was driven into the stadium, followed by Orlando Pirates players and officials. Mourners cried as videos were played showing Meyiwa training and playing football. Celebrating Senzo Meyiwa's life was the main theme for the tens of thousands of fans who packed into the stands. Fans from his team, the Orlando Pirates, but also from their rivals, the Kaiser Chiefs, sung Senzo's praises - both his ability on the pitch, and his behaviour off it. But there were also posters calling for justice for his killers, and a tougher stance from the South African authorities over gun-related violence. Underlying everything was a sense of injustice that one of Africa's most promising football talents could be killed in such a way. The chairman of the country's football association said he hoped that this could be a "turning-point" in the long-running debate over violent crime. And Senzo Meyiwa's father Sam told me he wanted more random searches, to cut the number of guns in South Africa. "We are no longer safe in our houses," he said. "The entire nation is crying. We have all lost. Our condolences to Orlando Pirates and Bafana Bafana," said Durban Mayor James Nxumalo, AFP reported, using a nickname for South Africa's national team. President Zuma ordered the national flag to be flown at half-mast on Saturday to honour the goalkeeper. Following Meyiwa's death, South Africa's domestic football league postponed this weekend's scheduled Johannesburg derby between Orlando Pirates and rivals Kaiser Chiefs. The Durban stadium was also named as the venue for host South Africa's next Africa Cup of Nations qualifier. The funeral of another South African sporting hero, former 800m world champion Mbulaeni Mulaudzi, also took place on Saturday. Mulaudzi was killed in a car accident the day before Meyiwa's death. Police said on Friday that a suspect had been identified in Meyiwa's killing after an identity parade. The man, named as Zanokuhle Mbatha, 25, faced charges of murder and armed robbery at a court hearing and is due to appear again on 11 November. Police had offered a reward for information on the attack. "There are still other suspects outstanding and we appeal to the public to continue providing information in support of the investigation," a police statement said. Media captionHow violent is South Africa?